PhotoFlight Aerial Media team introduces new powerful tool in their drone camera fleet. PhotoFlight Aerial Media is a CT, MA, NY, NYC, NJ, drone service provider with nationwide reach, specializing in professional quality drone cinematography, drone photography, and engineering drone applications. PhotoFlight Aerial Media is a live drone news broadcast provider of choice for NBC News Drone Ranger Program. PhotoFlight Aerial Media Team is excited to offer a new drone zoom camera service to our industrial and media clients using state-of-the-art DJI Z30 unit. This stabilized drone camera features 30x optical zoom and 6x digital zoom for total magnification of 180x. This incredibly powerful new tool is currently revolutionizing the ways the drones are used in sports, event, and news broadcast, as well as infrastructure inspections and other industrial uses. DJI Z30 zoom camera gives you the access, perspective, convenience and price efficiency of a drone, while mitigating any disadvantages of using “traditional” drone camera, such as issues with launch sites, proximity to people/objects, or controlled airspace. It gives us the ability to safely capture clear images and live video of scenes from up to 3 miles away, in a fashion a helicopter or a blimp equipped with a zoom camera would. This allows us to safely cover news and events safely and at the fraction of a cost of traditional aerial vehicles with powerful zoom camera systems. With Z30 you can eliminate potentially dangerous situations or risk of damage to assets by flying and filming from a safe distance. We also have the ability to provide Live HD Broadcast from our drones directly to our clients, using our professional broadcast equipment. 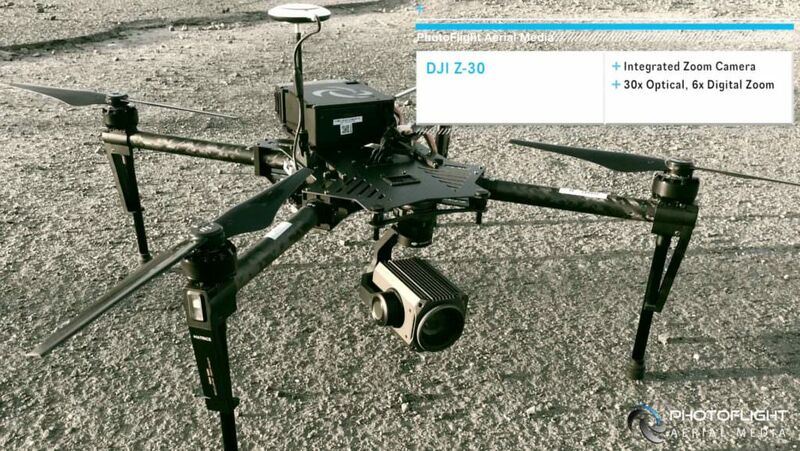 DJI Z30 30x Optical Zoom Camera at 1 Mile distance. DJI Z30 30x Optical Zoom Camera at 2000ft distance. Contact PhotoFlight Aerial Media for more information about our zoom camera drone services.